WHEN you’re starting to string the lights around the Christmas tree this year, give a thought to those who do the job on the National Christmas Tree outside the American Presidential White House in Washington DC. Because that Tree is some 15 metres tall and lit with no fewer than 81,000 blue, green and red static lights interspersed with white twinkling ones, that takes a crew of five a whole ten days to install. 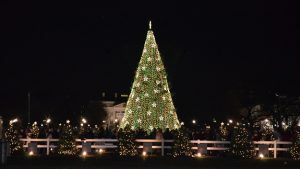 The tradition of the National Christmas Tree goes back to 1923 when then-President Calvin Coolidge had a Balsam Fir brought in from a nearby forest, and erected and illuminated on what is known as the White House Ellipse, a 21 hectare public park adjacent to the Presidential residence. Some 2,500 electrical bulbs were used on that first National Christmas Tree, with cut-down fir trees subsequently being brought in every Christmas over the ensuing years. And when it was decided to give the White House its very own permanent Christmas tree in 1973, that first one unexpectedly died just five years later, and was replaced with the current Colorado Blue Spruce planted in 1978. The Tree is encircled every Christmas with a vast toy train set whose nine little trains run around on some 300 metres of tracks, with all this in turn surrounded by fifty-six other smaller Christmas trees representing every American state and territory, and decorated with handmade ornaments representative of an aspect of each of those states and territories. The National Christmas Tree’s 81,000 lights are turned on from 4.30pm to midnight every night from late November until early January. 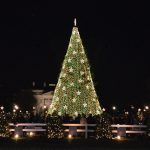 THE Presidential White House National Christmas Tree is lit up every night from late November to early January, drawing thousands of visitors to marvel at its 81,000 colourfully twinkling lights and decorations.